De’Longhi has 20+ different coffee machines. Bean-to-cup; Nespresso capsule; Espresso; Filter – it has all the bases covered. But which is the Best De’Longhi coffee machine? Good question, in this article we’ll explore exactly that. See also: The Best Coffee Machines of 2017. The answer entirely depends on what sort of coffee machine you’re looking for and how much you’re looking to spend. Below you’ll find a curated list of what we consider to be the Best De’Longhi Coffee Machines. Whether you’re looking to spend less than £100 or over £1500 to get the best of the best, we’ve got you covered. But first, a bit about what makes De’Longhi so special. De’Longhi was founded over 100 years ago in 1902 in the small (ish) city of Treviso in north-west Italy. Since the family-owned days of the early 20th century, De’Longhi has grown into a billion-dollar company that owns 30 international subsidiaries and sells its products in over 75 countries across the globe. Today, De’Longi’s reputation is one of style, reliability and innovation. In 2007, the brand won the Red Dot award – an international product design and communication design prize – for its Esclusivo line of kitchen appliances. These qualities are still found it its range of coffee machines today. The PrimaDonna Elite is the flagship coffee machine from De’Longhi. Why? Because it can make practically every hot drink. Cappuccino, latte, Americano, mocha, hot chocolate – all bases are covered. The PrimaDonna Elite is more than just a multi-beverage machine. It’s designed to take the pain out of making quality coffee. This machine self-cleans! You can even fine-tune your coffee recipe and set user profiles to your individual taste- there’s also a smartphone app that lets you prepare your coffee remotely. The Dinamica Ecam is a more competitively priced coffee machine from De’Longhi. However, there are some clear omissions in this range. The biggest letdown, for the price, is the separated milk wand – meaning if you want to make a latte or cappuccino, you’ll have to do so in two stages. That aside, the machine is solid. It has plenty of presets and customisable features and its 1.8-litre reservoir is more than ample. See also Nespresso Krups Prodigio review. The Caffè Corso represents De’Lonhi’s budget bean-to-cup coffee machine – although it’s still not cheap compared to similar specced machines from rival manufacturers. There’s no touchscreen and the design is more basic than its pricier siblings. It’s still simple to operate and makes De’Longi quality coffee. 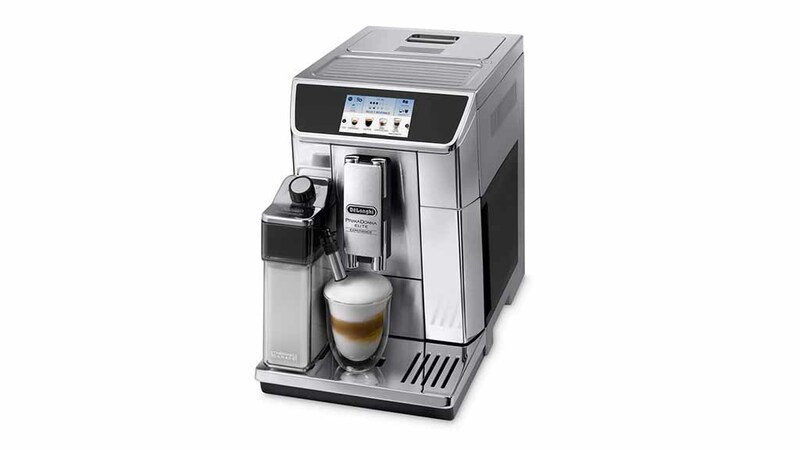 The De’Longhi Lattissima Touch represents the brand’s most stylish and best value for money machine. The machine has both a water and milk reservoirs allowing you to make multiple drinks at the touch of a button. At £309 it’s competitively priced. Arguably, the Scultura ECZ 352 is the most stylish coffee machine in the De’Longhi range. Looks aside, it’s a solid machine and it’s well priced. It’s a manual espresso machine with a separate milk wand for frothing milk. Those looking for a press and go coffee machine should look elsewhere. See also: The BEST capsule coffee machines of 2017. The Jovia EDG 250 is De’Longhi’s budget coffee machine. Its design is completely different to the rest of the range as is its price tag. What you get with the Jovia EDG 250 is a cheap capsule coffee machine that makes coffee at the press the press of a button. It scores well from reviews sites, consistently winning between 4-5 stars out of 5.